Lasagna is delicious, but it can be a bit heavy with all the white pasta noodles. Here is an alternative that is so easy. Bake one spaghetti squash in the oven on 400 until soft. I bake mine whole, on a pan, for about an hour and a half. When you take it out cut it in half with a knife. Set aside to cool. Brown up Italian sausage, ground beef, or turkey. When it is all browned add half of the spaghetti sauce. Set aside. Combine low-fat ricotta cheese, low-fat cottage cheese, low fat Italian cheese blend and two eggs. Mix well. In a large 9×13 pan layer half of your browned meat, half of the spaghetti squash, all of the ricotta cheese mixture, the other half of the spaghetti squash. Then the rest of the browned meat, the last of the spaghetti sauce. Cover it with tin foil and put into the oven. Bake 350 for 30 min. The sides should be bubbly. Top with shredded Italian cheese and put back into the oven uncovered to melt. 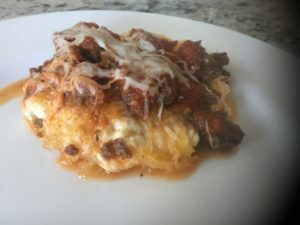 Our kids actually like lasagna better with spaghetti squash. Be sure to pair this dish with some delicious greens.